For most high school soccer teams, a season can have a perfect ending with a state title. But the High School Cup, consisting of four competitions across the country, is a new test for teams that want to compete against top competition for a shot at taking home a championship. Eight Georgia teams competed in the first-ever Southern Coast Cup, a brand new branch of the national event, and two took home division championships last weekend. Originally the nationwide event was composed of one single tournament, the Smoky Mountain Cup. Held in Gatlinburg, the first several Smoky Mountain Cups mostly featured teams from in Tennessee. Through its first two years of play, no team outside of Tennessee had won its division in the Cup. The 2016 season saw a change on the leaderboards when three Georgia teams (Dalton, Central Gwinnett and Westminster) placed first in their respective divisions. Since then, teams from all over the Southeast have congregated to give their teams exposure to top talent from around the nation. The addition of three new tournaments in the Cup have given the event a whole new importance in high school soccer. The Thoroughbred and Hall of Fame Cups were created during the 2018 fall soccer season, opening up the stage for more diverse competition. Played during the fall soccer season, the two tournaments set up in Elizabethtown, Kentucky, and Canton, Ohio. 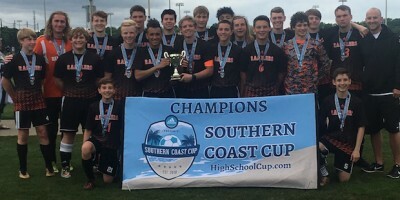 The expansion wasn’t done yet, however, as the Southern Coast Cup became the last of the tournaments to be installed. Held in Foley, Alabama, it’s the only Cup of the four to be held during the spring soccer season. Its inaugural debut last weekend from April 5-8 featured 79 teams from across the nation, including four boys and four girls teams from Georgia along with a team that some polls consider the best in the nation, Wando out of South Carolina. Of the eight Georgia teams participating (Brookwood, Discovery, Westminster and LaFayette, boys and girls for each program), two schools managed to put up strong three-game performances that led to division championships after round-robin play. The Lafayette Ramblers headed into the Cup with a 7-2 record, eager to take on the out-of-state competition. 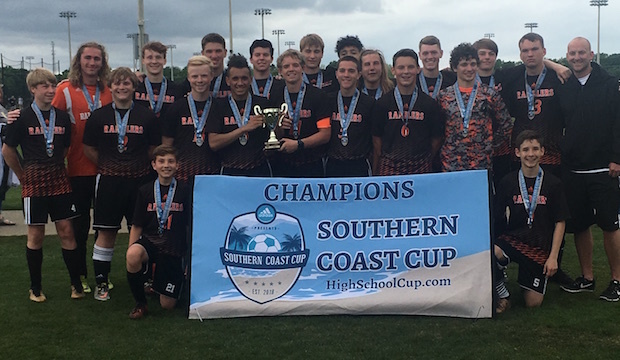 The Ramblers walked away from the Southern Coast Cup first in their group, the Mobile Bay Division, besting second-place Gatlinburg-Pittman (Tennessee) and Citronelle (Alabama) while tying against Park Crossing (Alabama). In their first match against Citronelle on Friday, the Ramblers quickly gained the lead with four goals in the first half from Tobey Aggeler, Max Studdard, Julian Murray and Ethan Murray. The scoring wouldn’t stop in the second half as freshman Karson Ledford found the back of the net for his first goal of the year, making it a 5-1 win. Their second match, also on Friday, resulted in a 0-0 draw after a stalemate with Park Crossing. Beau Thrash was a huge presence in the goal, saving eight shots to preserve the draw. The Ramblers ended their weekend strong against Gatlinburg-Pittman in the division finals on Saturday. A victory was the only way to ensure the championship, and LaFayette prevailed thanks to an offensive spark from Aggeler. The sophomore forward/midfielder knocked in a goal and racked up an assist in the second half. Paired with goals from Ben McDaniel and Ethan Kennedy, the Ramblers’ second-half resurgence was enough to claim the 3-1 win and division title. Walking away with the Moccasin Bay Division championship were the Westminster Wildcats boys. The Wildcats went into the tournament 12-0, making them one of the fiercest competitors in attendance. Westminster managed to keep its loss total at zero after its Southern Coast Cup debut. The team’s first game against Edmond North (Oklahoma) showcased senior forward Alex Gracey, who knocked in two goals in the 4-1 win. The Wildcats’ second game ended in a 0-0 draw against Norman North (Oklahoma) thanks to a shutout performance from senior goalkeeper Chris Block. The most impressive game by the Wildcats came at the end of the Cup when they faced off against Davidson (Alabama). Junior forward Charlie Ham found the back of the net three times, fueling the offense to a 6-0 win. Goalkeepers Tanner Hines and Block both contributed to the shutout. With each of the four regional tournaments completed, all teams that participated will be ranked by Topdrawersoccer.com at a later date. The spring and fall High School Cup champions will be awarded to the highest-ranked team, which will display the trophy in their school until the next champion is crowned. No Replies to "Georgia soccer teams thrive in Southern Coast Cup"